Monkeys have the most colorful faces of all mammals. New research says there are links between monkeys’ color patterns and their social structure and environment. The study, led by Sharlene Santana, assistant professor of biology at the University of Washington and the curator of mammals at the Burke Museum of Natural History and Culture, examined 139 species of catarrhines, a group of Old World monkeys and apes from Africa and Asia. 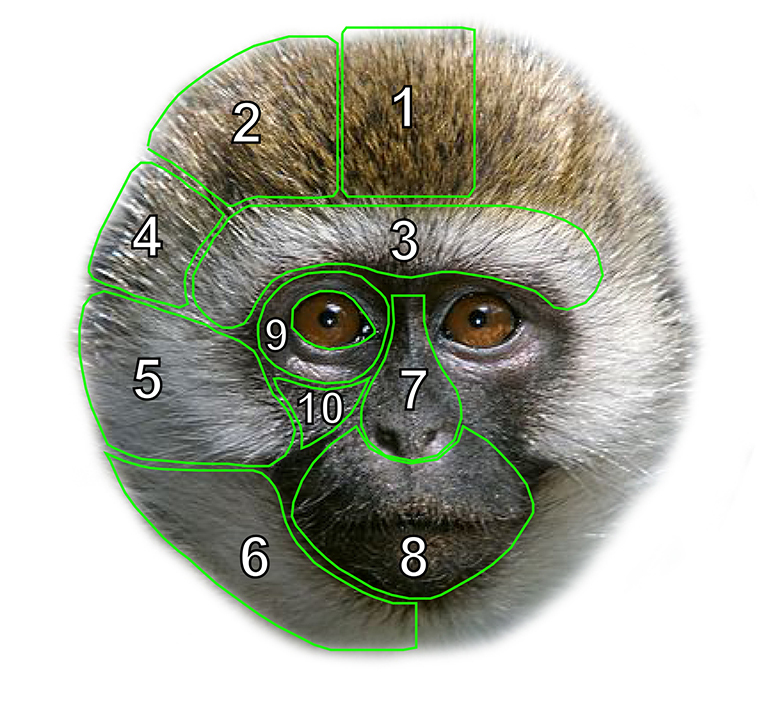 To compare faces, Santana and her co-authors conducted complex analyses of hundreds of monkey “head-shots” from online databases. The study, published in Nature Communications, found that species that live in larger (more social) groups have faces with more complex color patterns than those that live in smaller groups. These color patterns have also evolved to be more complex when closely related species live within the same area, possibly making it easier to tell each other apart. Geographic location and environmental factors were also significant for the evolution of facial colors of the monkeys and apes studied. Species that live closer to the equator in dense, humid forests had darker faces than those who live in less vegetated and dry areas further away from the equator. When living in a dark forest environment, darker face colors potentially help camouflage these primates so they go unnoticed by predators. Interestingly, only primate species living in Africa show these trends, potentially because environmental gradients are more accentuated in this continent. This study is a continuation of research by Santana and colleagues. In a previous study analyzing facial colors and complexities of New World monkeys, Santana found monkeys living in dark forests had darker colors on their faces compared to those that live in different environments, similar to the results for Old World monkeys and apes. However, one of the social aspects of this present study is the opposite of the results for New World monkeys. New World monkeys that lived in smaller groups tended to have more complex color patterns than those who lived in larger groups. The researchers are looking forward to addressing what factors could be underlying these differences between New and Old World primates.